* Here are some new images I just found. The last one is almost as good as the trench in the baseball diamond. * The above image is interesting, as it suggests a rille in wood, if that's what it is. * The next two are Michael's contributions, but I don't know off-hand where he got them. * This image doesn't show the details that the baseball diamond rille shows, but it's a rille in grass-covered soil, instead of bare soil. * I like the "Earth rille" evidence and Juergens' table, because it seems pretty obvious that the rilles on the planets and moons must be caused by lightning, like the ones here on Earth. 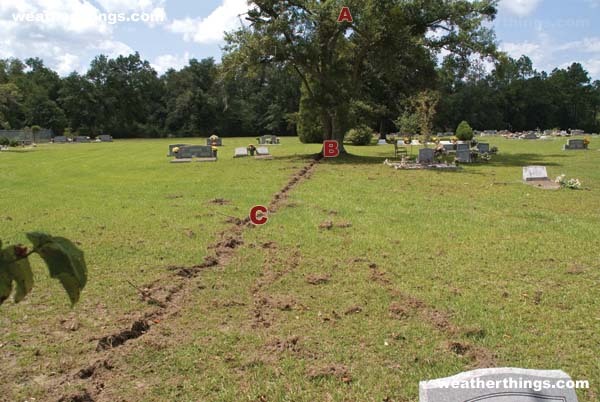 And that helps lead to the suspicion that craters are also formed electrically, since many rilles have long stretches that are essentially chains of craters. Then there's Valles Marineris, which looks like a huge rille and on and on. * What else is among the best visual or graphic evidence of EU theory? What has convinced you or your friends? * Might it be worthwhile trying to contact the weatherthings owner? If so, be my guest and try to contact himher. Last edited by nick c on Wed Apr 13, 2011 7:32 pm, edited 2 times in total. Re: Best Visual, Graphic EU Evidence? I do agree that Ralph Juergens presented some very convincing evidence in his 'Of the Moon and Mars' papers parts 1&2. First: thanks to Lloyd for launching this thread, and for the links and photo. Second: JohnMT, before I comment on the BAUT forum slugfest, I'll need to read all four pages of it. But as I begin, may I know whether you're the poster named "John T"? * How about providing a few significant excerpts? How about providing a few significant excerpts? Do these experiments performed by Dan Durna also reveal various aspects of typical crater morphology such as circularity, central peaks, terraced walls, flat floors and other complex features? I don't know about Durna, but the features you asked about were all recreated in Laboratory cratering experiments about 40 years ago. See Some Results Deduced from Simulation of Lunar Craters, P.F. Sabaneyev, IAU Symposium 14, The Moon, pp. 419-432, 1962. You can download the paper as a PDF file, or look at the scanned page images. Central peak, terraced slopes, rays, all there. Figure 1, which strikingly resembles the lunar crater Copernicus, is actually a picture of a simulated crater. There are still journal papers on crater simulation, but very little that discusses these features, since they are "old news". There are some text books I have seen that cover this stuff, but I can't remember specifics at the moment. To my mind, the "electric-cosmos" concept has not been refuted at all. Then other posters such as "landedeagle" and "soupdragon2" appeared on the scene. I should add that the NASA explanations nearly convinced me at one stage, but later on I soon realised they were wrong. Well, I don't know whether there's enough "graphic evidence" to 100% vindicate any and all aspects of the Electric Universe theory. However, there do seem to be a number of good images out there that certainly lend credence to the idea. From "NASA Spacecraft Make New Discoveries About Northern Lights" there's the accompanying multimedia: "Flux Ropes Power the Magnetosphere! THEMIS discovered a flux rope pumping a 650,000 Amp current into the Arctic"
There's the THEMIS discovery of "electric tornadoes in space" and its associated multimedia image: "New Finding Shows Super-Huge Space Tornados Power the Auroras"
So, yes indeed, currents *do* in fact flow through the tenuous plasma (NOT a perfect vacuum) of space. In fact, in the "NASA Spacecraft Make New Discoveries About Northern Lights" piece it's pointed out that the "magnetic flux ropes" (electric currents carrying 650,000+ Amps) are coherent "ropes" (filaments) and point all the way back to the sun across interplanetary distance. The satellites have found evidence of magnetic ropes connecting Earth's upper atmosphere directly to the sun," said David Sibeck, project scientist for the mission at NASA's Goddard Space Flight Center, Greenbelt, Md. Precisely as Birkeland predicted back in the early 1900's. Kristian Birkeland wrote: The knowledge gained, since 1896, in radio-activity has favoured the view to which I gave expression in that year, namely, that magnetic disturbances on the earth, and aurora borealis, are due to corpuscular rays emitted by the sun. Kristian Birkeland wrote: experimental investigations with a little magnetic terrella in a large discharge-tube, and by mathematical analysis, we have endeavoured to prove that a current of electric corpuscles from the sun would give rise to precipitation upon the earth, the magnetic effect of which agrees well with the magnetic field of force that was found by the observations on the earth. Kristian Birkeland wrote: The experimental investigations which at first were designed to procure analogies capable of explaining phenomena on the earth, such as aurora and magnetic disturbances, were subsequently extended, as was only natural, with the object of procuring information as to the conditions under which the emission of the assumed helio-cathode rays from the sun might be supposed to take place. Kristian Birkeland wrote: It was in this way that there gradually appeared experimental analogies to various cosmic phenomena, such as zodiacal light, Saturn's rings, sun-spots and spiral nebular. Kristian Birkeland wrote: The consequence was that attempts were made to knit together all these new discoveries and hypotheses into one cosmogonic theory, in which solar systems and the formation of galactic systems are discussed perhaps rather more from electromagnetic points of view than from the theory of gravitation. An excerpt from his scientific experiments in the lab is available here. These are the kinds of real-world images and comparisons to real-world experiments that convince me of the correctness of the propositions involved in an Electric Universe. I don't know whether they'll convince others, but they're certainly a start. Likewise the agreement between Don Scott's paper on the incorrectness of "magnetic reconnection" (so-called) and Cluster's real-world observations. That tends to be a relatively compelling argument for me. Granted, Cluster scientists interpreted via "reconnection," whereas I tend to think that Don Scott's paper gives a more "complete" picture of what's going on (literally). The new model describes how sigmoids consist of many thin and twisted layers (or ribbons) of strong electric current. When these layers interact it leads to the formation of the observed powerful flares and the eruption of strong magnetic fields which carry highly energetic particles into interplanetary space. The team also found that as the sigmoids die out, they produce a ‘flare’ eruption. Again, it's these simplifying assumptions (one theory that unifies multiple otherwise disparate features & processes) and good accord with data from multiple sources that seems to indicate to me that Thornhill and others are on the right path. One could also point out that PIC simulations appear to match up with actual galaxy morphologies, sans having to invent any hypothetical entities like "dark matter." Again, simplifying assumptions are a good thing. 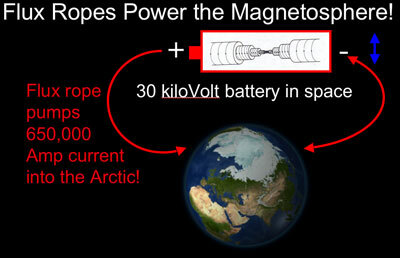 They finally find *evidence* of the electrical currents generating the magnetic fields in space! And so... what do they do?? Why- they go about creating experiments to show how magnetic fields cause "bi-directional energetic electron beams along the magnetic field"! which I think are among the best visual evidence. I don't have them organized well yet. Does anyone want to say which of those you think are best? *edit* Whoops! I misread your question. I tried to follow the link to see which ones you put in there, but the server responded that it couldn't find the page. How long would it take to make scars like that on a planetary scale? The residual after sparks are beautiful. Do you have an idea what keeps the smaller sparks going after the main blast? Maybe either the material is highly charged at a molecular level so although the main areas have discharged there is secondary discharge occuring from new areas/molecules, or, the main force for the continued sparking could be the counter-electromotive force (Back EMF)? Back EMF is the force seen when your TV or lights flicker after the Fridge or AC stops running. Not sure if it happens with modern posh TVs though! Are TLP's (transient lunar phenomenon) a one off discharge or are they related to the moon still discharging after its last scarring?